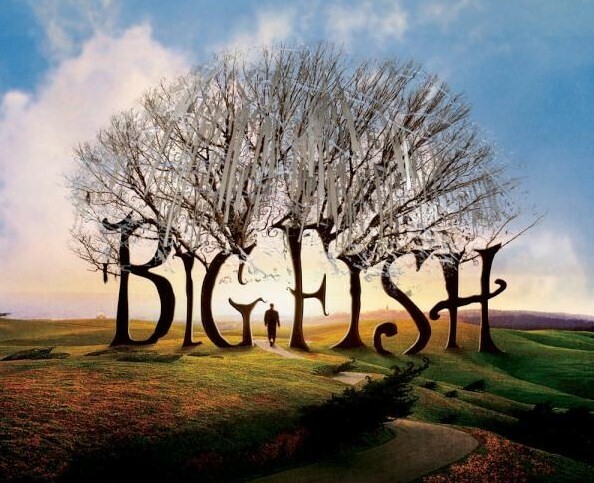 Auburn-area promotional poster for 2003’s “Big Fish.” We wish. “Big Fish” is stylized, celluloid confirmation that our school, our town, our girls and campus and general sense of rah-rah romance is indeed the stuff of Hollywood— and not just as a story: there were, like, actual, beautiful Auburn girls cast as extras in “Big Fish,” chief among them Nikki Speake (’01), frontwoman for turn of the century Auburn rock legends Virgil Otis and Whistle Bait, and one of the most actual, beautiful Auburn girls ever. Unlike “A Love Song for Bobby Long,” we’ve never received an email tip about “Big Fish”— it was such a big movie from such a big director (Tim Burton), and with such big stars, most folks undoubtedly assumed that the folks in charge of a Website dedicated in part to tracking Auburn in pop-culture would have already heard Danny DeVito and Albert Finney pronounce “Auburn” with that stilted faux-drawl (almost as if it were hyphenated), already seen Ewan McGregor stalk the girl of his dreams on Auburn’s (well, technically, Huntingdon’s) campus, already know that if Auburn needs its own “Forest Gump,” then “Big Fish” is it. And they’d be right. But likely lesser known than the Auburn references in the 2003 movie is the incredible Auburn-related content in the same-named 1998 book by Daniel Wallace on which it’s based (Wallace actually has a bit part in the movie as Auburn professor). And like it usually goes with books vs. movies, the stuff in the book has infinitely more depth and a more lasting ummmph. Why have we waited more than two years since starting The War Eagle Reader to tackle “Big Fish”? Laziness and procrastination. But not as much as you might think, because as soon as I’d made up my mind to finally do it, I knew it’d have to wait until Iron Bowl week, regardless. Here’s the chapter titled “The Day I was Born.” Read the whole thing, and dream of Saturday. The day I was born Edward Bloom was listening to a football game on a transistor radio he had tucked into his shirt pocket. He was also mowing the lawn and smoking a cigarette. It had been a wet summer and the grass was high, but today the sun beat down on my father and my father’s yard with an intensity recalling an earlier time when the sun was hotter, the way everything in the world used to be he hotter or bigger or better or simpler than things were right about now. The tops of his shoulders were as red as an apple, but he didn’t notice because he was listening to the biggest football game of the year, the one that pitted his school team, Auburn, against their nemesis, Alabama, a game that Alabama invariably won. He thought of my mother, briefly, who was inside the house, looking at the electric bill. The house was as cold as an icebox, but still she was sweating. She was sitting at the kitchen table looking at the electric bill when she felt me urging her along, dropping into position. Soon, she thought, taking a breath in quickly, but she didn’t get up, or even stop looking at the bill. She just thought that one word. Soon. Outside, as he mowed the lawn, it wasn’t looking good for Auburn. Never did. It was the same every time: you went into the game believing that this was going to be the year they did it, this was going to be it, finally, and it never was. It was almost halftime, and Auburn was already down ten. On the day I was born, my father finished the front and then started the backyard with a renewed sense of optimism. In the second half Auburn came out charging and scored a touchdown on their first possession. Now down only three, anything was possible. Alabama scored just as quickly, and then, off a fumble, they scored a field goal. My mother placed the electric bill flat on the table, and pressed it with her hands as though trying to get out the wrinkles. She didn’t know that all my father’s hard work and perseverance would, in a matter of only a few days, pay off handsomely, and that she would never have to worry about an electric bill again. For now the world, the entire planetary solar system, seemed to orbit around the center that was this bill for $42.27. But she had to have the house cool. She was carrying around all this weight. Naturally she was a slim woman but she was a big as a house now with me inside her. And she liked it cool. She heard my father in the backyard, mowing. Her eyes widened: I was coming. Now. I was coming now. Auburn was making a comeback. Time passed. She calmly gathered her hospital things. Auburn had the ball with but a few seconds remaining. Time for a field goal. On the day I was born, my father stopped mowing the lawn and listened to the announcer’s voice on the radio. He stood like a statue in his backyard, half of which had been mown, half to go. He knew they were going to lose. On the day I was born, the world became a small and joyous place. My mother screamed, my father screamed. On the day I was born, they won. “Big Fish” graphic by Auburn Elvis. Related: ‘Big Fish’ author Daniel Wallace objects to use of Bama pennant in Broadway production. * Bear Bryant, Auburn fan? Like us on Facebook. Follow us on Twitter. Want to advertise? Good story, but I wonder about a man cutting the grass in late November. Love it. 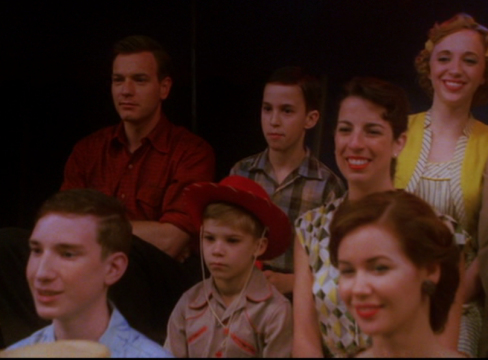 “Big Fish” is one of my favorite movies of all time. I’ll have to pick up the book. Yep, I remember that. Thanks for sharing. I don’t believe in fate (I believe you can only count on what you earn) BUT – it this is sign that you covered Big Fish before the Iron Bowl…listen to this: Last year we “Nashville” Auburn family gathered to wathc the first game of the season. We joked, dreamed, and pondered how this Cam Newton fellow was going to do. We were flipping between game and stumbled onto Big Fish on AMC. We flipped to it literally as Devito says, “Her name is Sandra Pempelton…she goes to AUBURN.” Regardless of what happens saturday – It’s ALWAYS great to be an AUBURN TIGER! That movie was AUsome!. The wife and I even swung through Wetumpka a few years back to visit the Big Fish house and see a few other sites. War Damn Big Fish! Reading this on the anniversary of the day I was born got me choked up a bit myself. Thanks as always for the fantastic content, Jeremy. BTW – can anyone place the year this game may have been? I’m thinking it was 1970. AU got down in the first half, but the Sullivan to Beasley express lit it up and AU won with a field goal at the end. Good stuff! One of the guys I graduated Auburn architecture with (May 2007) is one of the male dancers in the Utopian City scene. And my brother’s wife is expecting, maybe the day I become an Aunt we will win again! War Eagle! I cut my grass in Camden Ridge in Auburn 2 days ago. It’s possible. I won’t have to touch it again for quite a while, though. It’s HuntingDon NOT HuntingTon! Geez…….. Corrected. Our sincere, sincere apologies, Matt. We didn’t mean to offend. This story reminds me of the day I was born…November 27th 1982…Bo over the Top. I LOVED this movie…I saw it right after my Nana (Italian grandmother) died. They filmed Auburn scenes at Huntingdon, they asked Auburn, but the school wanted script approval and they didn’t have time to wait for it. So I was told. Honored both of my schools–Go Hawks and War Eagle!